19627 Walnut Street, P.O. Box 157, Trimble, OH 45782. Perry, Athens, and Morgan Counties. The headwaters of Sunday Creek originate north of Corning. The creek then flows south 27 miles through Chauncey and into the Hocking River. 25 of 38 affected stream miles meet the pH target of 6.5. The Sunday Creek Watershed has been affected by a history of extensive underground mining. In addition to acid mine drainage, the area suffers from wastewater pollution, illegal dumping, and sedimentation. Sunday Creek Watershed is primarily wooded (78%). 38% of the watershed has been deep mined for coal, and 15% of the land is public, owned by the Wayne National Forest. Culturally, the region boomed when the demand for coal was high and mining became the dominant economic force throughout the area. Red clay was also found to be abundant in the soil and brick factories began to appear in every community, with Appalachian bricks gaining a worldwide reputation for quality. When many of these industries disappeared from Southeast Ohio, it left scars on both the people and places of the Sunday Creek watershed. Acid mine drainage pollutes creeks while abandoned or economically depressed communities leave few career opportunities for current generations of residents. 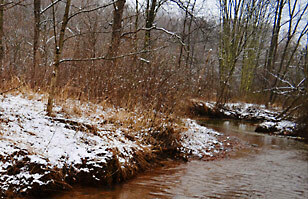 The Sunday Creek Watershed Group was formed in 1999 by a group of watershed inhabitants.